Google is scrambling to distance itself from a ten-page memo currently circulating around the internet and written by an employee. A male, self-described “classical liberal” outlined his ideas on gender in a document he titled “Google’s Ideological Echo Chamber.” In it, he appeals to generalities about men and women’s psychology as it relates to tech and leadership, and objects to some of Google’s gender-related practices, including a focus on too much sensitivity. Common Sense Advisory (CSA Research) came out with a response this morning focusing on the positives of having women in leadership roles in the global tech-interfacing localization industry. Stereotypes about who traditionally does what in a job may vary depending on location. They are not based on psychological universals. 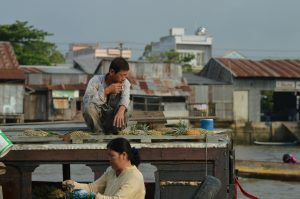 Here, a man and a woman work on a boat selling pineapples in Vietnam. Photo by Katie Botkin. It’s always intriguing to see evidence of this kind of thing in hard data. I read the piece, actually, immediately after having had an unrelated money conversation with a male business owner over breakfast. He was freaking out about his profit and loss sheets, and was unsure how he’d managed to spend so much. We talked through it and I said it seemed pretty clear how he’d managed to spend so much: he was making ideology-based decisions about money rather than strictly budget-based decisions. In short, he was being emotional about money, his employees and the kind of work he wanted to do. And maybe he could do that, but he’d have to build it into his budget and sell it as an added bonus. I’m not going to assume all men do this with money. Psychologically, it’s interesting to note that men can be invested in the idea of being “providers” to the point that it may influence their choices around money. But then, this can also be true of women. It’s true of people in general. People want to take care of each other, and sometimes they prioritize that over hard money decisions.